At 06:00 GMT this morning, the Normandy Channel Race fleet was involved in a tough slog up to Tuskar Rock, of southeast Ireland, the frontrunners still some 30 miles short of the lighthouse. After rounding Land’s End while it was bathed in sunshine early yesterday afternoon, the competitors set out on the next part of the course with the 150 mile climb northwards to Tuskar Rock. For this they were upwind, the fleet taking a leg out to the west before tacking back to the north on to more of direct course following a wind shift to the left. 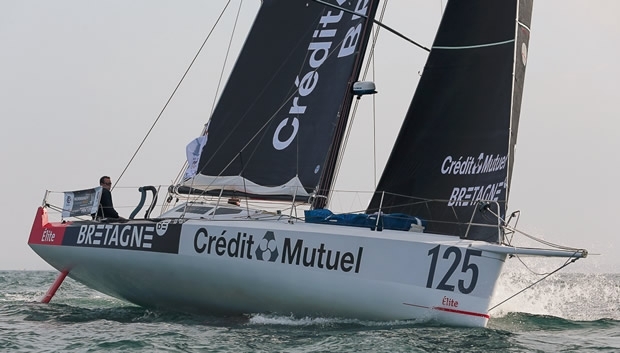 At around this time perennial leader, Nicolas Troussel and Felix Pruvot on Bretagne-Credit Mutuel, saw her lead, that at one point had increased to 10 miles after rounding the Lizard, diminish to just 1.3 miles by late afternoon. However, furthest out to the west when they tacked, Troussel and Pruvot tack were virtually able to lay the Tuskar Rock, extending their lead to more than 15 miles this morning. For those chasing, the timing of the tack has been a crucial decision - to tack north early but being unable to lay the Tuskar Rock or following Bretagne-Credit Mutuel's route west before tacking. A group of three boats that tacked early has done particularly well - Carac Advanced Energies, Columbre XL and Zetra - and now hold second to fourth place having previously out of the top 10.
ultimately it was the boats that forged west before tacking that have remained in front. Meanwhile Ned Collier-Wakefield and Wouter 'mind that reef' Verbraak on Concise 8 are leading the charge towards Taskar Rock from the west with Miranda Merron and Halvard Mabire on Campagne 2 France just inside of them. While most of the boats were able to lay the Rock overnight, this morning the wind has dropped and headed them once again. As Miranda Merron described it: “a road full of holes that is very badly tarmacked." This situation is set to last until early afternoon before a WSWerly fills in and will the remain the dominant wind for the next few days.